As you have probably already gathered, the NES Repair Shop has an extensive inventory of great Nintendo games NES, SNES, N64 and Gamecube games in stock (over 5000 titles). Yet what sets us aprt from other used game stores is that we we stress quality over quantity. 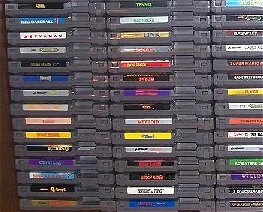 Though our Nintendo games and Systems are pre-owned (unless otherwise stated) they are not former rentals or the garage sale type games that you may purchase at flea markets or online auctions. Our games are of Outstanding Quality, both esthetically as well as electronically, and they are guaranteed to perform flawlessly or your money back. We don't sell any game disks or cartridges that are scratched up or carts with torn, worn or dirty labels. The cartridge games we sell have been professionally inspected and treated to make sure that they are in excellent shape, and have clean so that they are ready to place right into your NES, SNES or N64 console. Our Gamecube disks are never scratched up and guaranteed to play through. We go the extra mile because we put ourselves in your place. And if we wouldn't be happy with any game ourselves, we won't sell it to you. That's a promise! Secondly, unlike other stores, the pictures that you see of our games and systems are a fair and honest representation of the actual game that you are going to get. No surprises here. Again, these are the top quality games, not scratched disks or games with worn, fading, marred, torn or marked labels. Our inspection of each game that comes in insures we don't sell games with corroded or oxidized contacts. All our games are safe to pop right into your console from our shipping package. There is no need to pre-clean because we only sell the best quality pre-cleaned, deoxidized, gold treated, clean games. If you like what you see and buy here, we know you'll tell others and come back for more. As per our motto, "What the NES Repair Shop sells, sells the NES Repair Shop." And what we sell is quality and reliability at an affordable price! Moreover, if our store pages say something is "in stock," you can Believe that it truly is in stock. From our personal experience as NES collectors ourselves, we know that there is nothing more frustrating than to order something that is supposed to be in stock, and receive notice that it's no longer available and you'll have to wait 3 to 4 weeks for restocking. We pride ourselves in excellence and honest representation, service, and communication, and will usually ship your order out within 24 hours of receiving your payment. And if we don't have the game you are looking for indexed online, chances are we have it offline in storage. Drop us a comment concerning it, and we'll see if we can't get it for you. When we say communication, we mean it! We read, consider and answer all our mail, and we do it quickly (usually within the hour). Use the "Contact Us" form to ask any question or make any comment. Your comments, questions and suggestions are not only welcomed, but appreciated. It helps us to know how to better serve you.